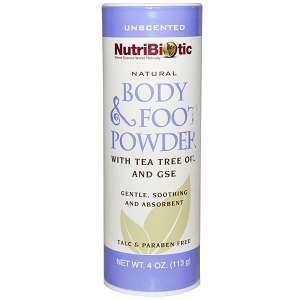 This is a review of Natural Body and Foot Powder which is manufactured and sold by NutriBiotic. This product claims to relieve the painful symptoms and powerful odors caused by fungal infections such as athlete’s foot, jock itch and diaper rash. Read on to learn if this product is right for you and your symptoms. The corn starch works to dry the affected area. It is an old and natural method for soothing damp areas where fungal infections tend to grow. Grapefruit seed extract is a common ingredient in medications that have antifungal properties. It is also used as a cleanser and a remedy for mild skin afflictions. Tea tree oil is said to have antibacterial, antifungal and anti-septic qualities. It is one of the most common natural treatments for fungal infections like athlete’s foot. This product is free of talc and parabens. The instructions listed on the retailer’s website state that you should lightly sprinkle the powder of your skin as often as you feel is necessary. They also state that you should use their cleanser before you do so. This product is for external use only and should be kept away from your eyes, nose and mouth. Tea tree oil is a very common oil. However, there are concerns about its use on boys who have not yet reached puberty. When used in combination with lavender, tea tree oil may cause hormonal changes in young boys and cause them to grow abnormal breasts. There is concern about women who consume a large amount of grapefruit products. There is a possibility that grapefruit can alter hormone levels and conditions that are hormone sensitive. There is a variety of vitamins and medications that interact with grapefruit. Consult your doctor if you are on any medications before you use this product. The price listed by the retailer is $4.78 for a 4 oz package of the Natural Body and Foot Powder. This price has been reduced from $4.78. If you buy it in bulk from the retailer, you will save 10%-15% off of your purchase. Neither the manufacturer or the retailer list a guarantee or a return policy. However, the retailer offers 93 reviews for the product, out of which, 58 reviews gave the product a five star rating. Most of the reviews do not provide very much evidence regarding the efficacy of the product. This product contains many of the most common natural cures for fungal infections including tea tree oil. It is inexpensive, easy to use and free of talc and parabens. However, this product does contain silicone dioxide. it also contains grapefruit seed extract which interacts with many medications and may have a negative effect on a woman’s hormones. This powder seems to work to absorb the dampness in your feet or other areas. It is not clear how long it will take to clear up an infection like athlete’s foot. Jimmy Rodriguez	reviewed NutriBiotic Natural Body and Foot Powder	on June 11th	 and gave it a rating of 2.5.